I had occasional problems with the serial (RS-232) driver I’m using. That code is generated by Processor Expert, and served me very well. Except that I had rare cases where the internal data structure of the driver (a ring buffer) got corrupted. I was considered many causes, from stack overflows to wild pointers. But never was able to truly track it down. Until now. A ‘critical section’ is an area in the code where I need prevent two ‘threads’ accessing the same data in parallel. In ‘parallel’ might be code which is executed by the main program, but can be interrupt and accessed by another task or by an interrupt service routine. So I need to make sure that only only one program is executing that sequence. Or that this sequence is executed as such that it cannot be divided up (it needs to be executed in an atomic way). the interrupt could happen, which would call Rx1_Put() too. The result would be that the ring buffer data structure would be corrupted. What I need is to put a critical section in place to prevent that my ‘critical’ code does not get interrupted. Interrupts can happen any time. As such, a running program can be interrupted any time. Shared code (e.g. a function) which is used both from different places like threads or interrupts can be interrupted any time. Access to data from such a function needs to be protected as such that the data integrity is kept. As such, every shared code between interrupts routines and the main program (or tasks) needs to be re-entrant: that the function can be ‘executed in parallel by multiple threads’. In the above picture, there is an interrupt at step 4, causing the interrupt routine to enter the subroutine too. the problem is that every data access inside that subroutine needs to be reentrant. My Ring Buffer uses shared *global* variables, but I cannot different instances (because they are really intended to be shared). So I need to protect the access to the shared variables with a critical section. For Disabling/Enabling interrupts Processor Expert generates EnableInterrupts() and DisableInterrupts() macros. ❗ Disabling Interrupts increases the interrupt latency time. Means that during this time other (or higher) interrupt priorities are not served. For realtime applications this can be a problem, so keep the critical section as small and fast as possible. The names of the macros tell the purpose: to create a critical section. So this is exactly what I need :-). ExitCritical() decreases the SR_lock variable. If it gets zero, it restores the original interrupt state from SR_reg. The macros are using *global* variables SR_reg and SR_lock. 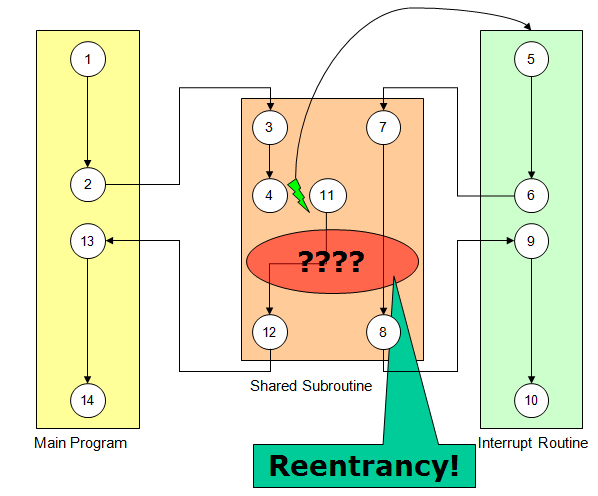 This raises reentrancy concerns as every access to global variables from interrupts or the main program can cause reentrancy problems. ❗ Note that earlier versions of Processor Expert did *not* use that SR_lock variable. So far, so good. Unfortunately that source code generated by Processor Expert is wrong! :-(. Christian Jost, research and teaching assistant at my university, has pointed me to that problem, and he had found as well this thread in the Freescale Forum which is about exactly that problem, but no resolution :-(. 💡 It does not have to be threads (in an RTOS sense). One thread could be the main program, and the other thread could be an interrupt service routine. are *not* atomic! The assembly instructions behind it can be interrupted any time (by a thread or interrupt, at least with the code generated for gcc. 14:   2b01          cmp    r3, #1           ; is SR_lock==1? 16:   d104          bne.n    22             ; If SR_lock!=1, then continue after line 20. 1e:   b672          cpsid    i              ; disable interrupts in PRIMASK. Interrupts are now disabled. Notice that before DISABLE INTERRUPTS interrupts are still enabled. So the instructions before it could be interrupted. If everything works as intended, then the SR_lock should be either 0 or 1. My point is that if it can happen that EnterCritical() is executed, and that a critical section is NOT established. At the beginning, SR_lock is zero. Thread A uses EnterCritical() to create a critical section. It load the SR_lock it into the register. Thread A increments the value. Thread A stores the incremented value. SR_lock is now 1 in memory. Now consider that just after this store there is an interrupt or thread switch. Thread B executes, and uses itself EnterCritical() to start a critical section. It loads the value of SR_reg (which is now 1) into the register. It increments the value in the register and it becomes 2. My ‘main program’, which runs from main() and calls test(). Access to the shared variable is protected with EnterCritical() and ExitCritical() to create a critical section. Inside that critical section I access the shared variable, and if the variable is not 1, then clearly the critical section has been violated. The stack trace shows my main program test() which gets interrupted by TU2 which itself gets interrupted by TU1: because the critical section is not working properly, SR_lock shows a value of 0x03 and the shared counter shows an illegal value of 0x02 :-(. ❓ There might be still the (small?) chance that I’m using the EnterCritical() and ExitCritical() not as intended (Blame me on ‘user error’)? But looking at how it is used in the drivers provided by Processor Expert, I feel I did nothing wrong? Once knowing a problem, it is much easier to find a solution :-). If you are nesting critical sections, make sure every instance has its own critical section variable. To test that new approach, I have updated the original program so I can easily switch between the original (failing) version and the new version. And the new version works :-). The point here is not about Processor Expert generating wrong code. Or who can say his code has zero bugs? The point is that reentrancy and dealing with interrupts and caring about critical sections is *critical*. If not, it can cause sporadic problems. Really nasty, hard to debug problems. I’m always amazed how sometimes code can be clearly wrong, but still it *seems* to work, only to fail when you really cannot afford have a failing system. Murphy? Maybe. I’m using the original EnterCritical() and ExitCritical() in many places of my code, so I better change it now ;-). And if you are interested in a similar topic: read the article by Jack Ganssle about Great Watchdogs. PS: Kudos to Christian Jost for implementing the improved EnterCritical() and ExitCritical() featured in this post! This entry was posted in Building, Debugging, Embedded, gcc, Kinetis, Processor Expert, Thoughts, Tips & Tricks and tagged arm gcc, Assembly, global variables, gnu gcc, Processor Expert, software, Thoughts, Tips&Tricks by Erich Styger. Bookmark the permalink. The DMB instruction should be used in Semaphore and Mutex operations. Example 7 shows simple code for getting a lock. A DMB instruction is required after the lock is obtained. Similarly, code for releasing the lock should have a memory barrier at the beginning. Example 8 shows simple code for releasing a lock. A DMB instruction is required before the lock is released. On a Cortex-M processor, you will not very often need to use the barrier instructions (DMB, DSB, ISB). They are needed when external memory is changed by someone else than the processor, namely when DMA bypasses caches or in shared memory on a multiprocessor systems. With Kinetis CPUs, you have a very small instruction pipeline, and a 2 entry in-order memory load pipeline. Since three NOPs effectively act as a barrier, I am not ever sure you could write any normal code where you would need to use barriers. I guess you really need to do something stupid like running in RAM and modifying the next instruction to trigger the problem. Yes, agreed on the barrier instructions. On the other side, I started to add them just in case I move up to a device which actually needs them. I have now downloaded MCU10.6, and it looks like they have fixed that EnterCritical() and ExitCritical() problem, but I had not had a chance to verify it. You are generally right, critical sections should nest properly, which means simple CPSID/CPSIE are not enough. This guarantee that critical sections are atomic for one thread. In simple applications the safest way is to make critical sections disable all interrupts, which makes the first requirement easy to meet. However, in special applications, it might be needed to classify interrupts in groups (usually two groups are enough), one group with scheduler related interrupts (interrupts that are allowed to use system synchronisation primitives) and the second group with interrupts with higher priorities. In such cases there are two kinds of critical sections; entering a regular critical section will raise the priority to a defined value and entering the high priority critical section (sometimes also called Real Time) raises the priority to the limit. Exiting a critical section always restores the priority existing when the critical section was entered. The simplest implementation of such critical sections uses local (stack allocated) locations to save the priority. // Sample usage. The block parenthesis are mandatory. For those not used with C++, the language ensures that the destructor is always called when the current block is terminated, so this method ensures that Enter() is always paired with Exit(). Which, you should admit, is quite convenient. The problem with SR_lock++ not being atomic is not a problem as long as EnterCritical() is only called in the foreground ie not from inside an interrupt handler. The style of coding I use has one timer interrupt, at the minimum period as required to service all peripherals. Typically this will be 100us on down to 10us (depending on the processor and application). So as there is only one interrupt, there is no need for using disabling interrupts from inside interrupt handlers. 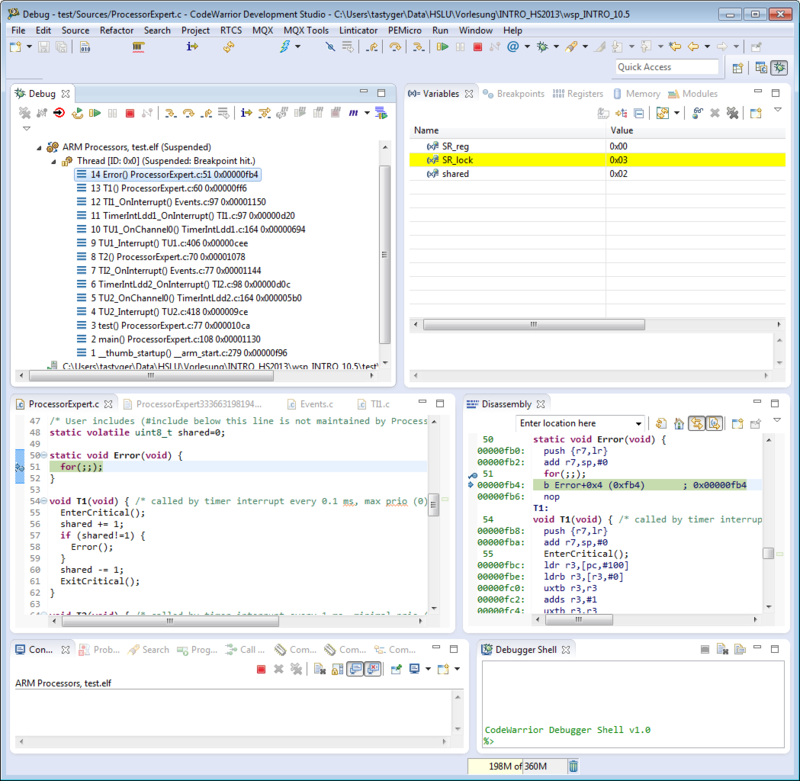 This method makes embedded programs easy to debug and reliable. The only reason I can see for using multiple interrupts from various peripherals is for low power operation ie battery. That is, assuming the application is a typical control application suitable for an M-series ARM chip or other such processor, in a control application. From what I could see, using Processor Expert with a Kinetis M4 and M0+, their code relies heavily on interrupts, and so once you start using multiple Processor Expert modules, things will get messy fast. I ended up re-writing it all. I noticed the same problem and solved it rewriting Enter/Exit critical in asm. In few words the key point is that until you write to a register you are fine because registers are saved by either CPU or compiler. But when you store a value into a variable, that one will become the section to protect first, so store instruction must be executed with interrupts disabled. Of course, as you said, if instruction set had been provided with INC memory_addr, no fault would have been occured. So the conceptual issue is, IMHO Enter/Exit Critical can never be implemented in C code by processor expert, whose aim is to support a wide spectrum of CPUs. There is still the problem of Code Motion. An optimizing compiler is free to reorder the code. It could very well move code you think is after the Disable Interrupt instruction to before it. It is important to put in memory barriers that stop code motion across critical section points. Each compiler handles how to do this differently. Yes, this is a very good point, thank you. I still need to wrap my head around how I can make it nice and clean that way. And you are correct with your note about the compiler. Most compilers use any assembly block/instruction as barrier too in order to avoid such problems. Do take a look at how AVR-LibC handles it. No reason to reinvent the wheel. Hi Erich, we are working on a K21 microcontroller. Our application is using about 10 free rtos task. We have already updated the PE in order to use th CS component. Our code is using the TMOUT to evaluate timeouts in the GI2C. The TMOUT addtick is placed in the ApplicationTick event of free rtos. The generated code is using critical section in the TMOUT, Debug Uart and USB CDC serial component. CS Component is configured to use the “new” version not the original one of critical section. In this setup we experimented “strange” timeout error in I2C READ of eeprom. Then we decided to replace the CS component implementation with the FreeRTOS taskENTERCritical and taskEXITCritical, modifying by hand the CS1.h files. The behaviour of the firmware changes and the error rate was lower. Finally we also replaced by hand the EnterCritical and ExitCritical calls embedded in the Uart mode. After this “patch” we were able to run our test benchmark without error. The benchmark last about of 12 hours. The test continously reads 500 byte every 100 ms from eeprom and receive every 30 ms from the UART port. I hope this information can be useful. And yes, I had to do the same on my side: replacing calls in the AsynchroSerial component code to use my ‘new’ version. However, I’m not sure why the RTOS enter/exitcritical had that effect. At which priority are the UART interrupts? And at which priority is the RTOS running? I ask because you are not allowed to use RTOS functions from interrupts above configMAX_SYSCALL_INTERRUPT_PRIORITY (see http://www.freertos.org/RTOS-Cortex-M3-M4.html). I have seen that violating that might cause subtle problems even after hours. Just tow question about Critical Section. There are some PE Code I use like TMOUT1_AddTick or TU3_ResetCounter that use Critical Section. In general I should pay attention to not use them in a ISR context right or not? For example Is it safe to call it in the FRTOS1_vApplicationTickHook that seems to be called from vPortTickHandler? my latest published Timeout (TMOUT1_*) component on GitHub already uses the new CriticalSection component. In question is every code using the default EnterCritical() and ExitCritical() macros from Processor Expert. In our tasks configuration there were two tasks with high priority that were blocking the task using the GI2C ReadBlock routine. So the timeout expired but also the interrupt had been correctly set. Pardon for my ignorance, but I can’t visualize the problem in the “real world”. If my ISR gets the control means the interrupts were enabled, so at the end of my ISR I must enable “global” interrupt,…because we are talking about “global interrupt”, is’n it? If is part of the main to disable and to enable global interrupts to protect part of the code, what is the problem?… specific interrupts are enabled or disabled individually. I know I’m neglecting something,…but what? i have a question regarding the “fixed” EnterCritical() code. then EnterCritical() continues with disabling Interrupts and storing R0 (now with a wrong value) into cpuSR. Could this scenario not disable all my interrupts and stop my program from working correctly? PS: assuming this code is implemented in the current version of PE. If not, i’m still interested in the theoretical behaviour. the ISR has to save/restore the registers modified inside the ISR, and the hardware will push/pop some of the registers anyway. So there is no issue if there is an interrupt just after the MSR instruction. ok, i understand. Thank you very much for the explanation. Hello Erich, I see you still reply so a question: I don’t understand the need to manage SR_lock in EnterCritical() and Exit Critical(). Wouldn’t it be enough to define them like this? The reason for the SR_lock is simply to have a (local!) variable to store the status. In order to deal with different implementation, the local variable is allocated with a macro. Maybe I misunderstood the logic: I was referring to variable “SR_lock”, not to variable “SR_reg”; isn’t the latter that stores the status?! Yes, SR_reg is used to store the status. SR_lock is used to allow recursive call of the critical section code. This is a simplified version of the code used in µOS++ IIIe / CMSIS++ (http://micro-os-plus.github.io); the actual code can also use BASEPRI, when available/needed. Also, why not pushing PRIMASK in the stack instead of writing it into a variable?! some time ago I also considered a similar solution, but I abandoned it after I encountered compilers that do not cope very well with assembly push/pop in the middle of regular C code. another advantage of this solution is that it does not use macros at all. macros are evil and must be avoided. About macros: as with everything, if used wisely it is not evil. I’m using macros for this Enter and ExitCritical because I have to use my code with many, many different CPU architectures (and ARM is only one). So using macros I can hide the machine dependent stuff nicely in a mostly portable way. C++ is not a option on small microcontroller targets (say 1 KByte of RAM and 8 KByte of Flash). > projects which have to be maintained and be alive for 20 years. I understand maintaining old projects for 20 years. I don’t understand using ’89 technology in 2016 (2016-1989=27) for new projects that need to be maintained 20 more years. Because that compiler for that architecture was created before 1999 (C99). That project has been deployed to the field in 1998-2004. You would be surprised to see how many electronics around you are built with this technology. did you evaluate using inlined functions? I just completed the implementation of the third edition of a C++ RTOS. to quote you, “used wisely”, there is no overhead, so, on a given set of resources, what you can do in C, you can also do it in C++, just much better structured. inlined functions does not exist in C89, and many of my older designs have compilers which support C89 only. Additionally, these designs only support EC++, so again C++ is not an option. And thanks you for your always interesting articles! this article only applies to ARM Cortex-M, not the other cores. That’s why (for compatiblity reasons) the component is using the normal Processor Expert Enter/ExitCritical() functions. The latest Processor Expert drop has fixed the problem discussed in the article, but with a slightly different approach, so you can use one or the other. Is it possible to use those macros with Cortex-M0 (without “plus)? I have tried check and seems it is the same interrupt model but I am looking confirmation. yes, the M0 and M0+ are very similar (I think only some better low power and some internal pipeline changes), so the same macros apply. We are using 10.4 version of PE and problem related with Critical Sections are still on the stage. In some rare case, we observe that main loop is still running but no any interrupt is serving, debugged the SR_reg and SR_lock and values were corrupted. (ie arbitrary values) What is weird; SR_reg is holding the shadow of the PRIMASK and it can only be ‘0’ or ‘1’ but was NOT ! Now we are digging in to detail but could not find the root cause yet and just want to share if there was any one experiencing the same problem. I will be here again at the end to give a feedback. could it be that you face a stack overflow problem, that your interrupt routine or something else is overwriting that memory area? I suggest you double the stack size to eliminate that possibility. Keep in mind that on the M4 the MSP is used for interrupts. We have not implement safety class functions (ie stack test ..) yet but I have kept your suggestion and its seem OK for 10 minutes. We need to obserbe a few couples of day. Thanks for your suggestion and time.